Okay, okay. I do realise that this is probably the most cliched, overused title in the history of photos or films set in London, but that's the beauty of it. Also, I am a genuine Clash fan and love the album 'London Calling' itself. But while we're on the subject of that, is it just me or does nearly every non UK film that makes reference to this capital city feel an incessant need to feature the same song as my title? So no surprises for guessing what the location of this shoot is! 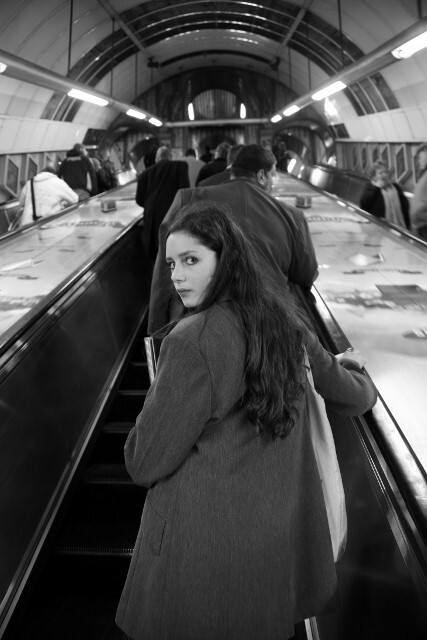 When we were in London for a brief visit a while back, my dad decided to pull out the camera at every opportune moment, including on the tube and in various very busy streets. As you can tell, my dad's a bit obssessed with taking photos in black and white at the moment- which makes great shots but isn't so good for showing off outfits. So I've included a colour one at the end to demonstrate what it actually looked like. The blue minidress is a vintage handmade one from the sixties I found on ebay- I just love the detail around the neckline. The crocheted cream vintage cardigan was given to me by my grandma, with the label detailing that it was hand made in Shanghai. The grey blazer is Jaeger, seen in a previous post... The leather belt was found for 30p in a charity shop and the boots are my mum's. The green twiggy bag is from good old Marks and Spencers and the book is my modeling portfolio. Regents Park is somewhere that I suggest everyone puts on one of those list of 'ten places to visit before you die'. Even thought this list concept makes me feel a bit queasy, in this instance it deserves its place! I'd love to do a full moon illuminated shoot there one night- preferably with me behind the camera. So tell me what you think. What are your favourite/ most picturesque parts of London or any other major worldwide city? Your outfit is amazing! These shots are like straight out of glossy! I've never saw one of your editorials on the street, in an urban ambient. I have to say that i loved!! I love all the black and whites and then the last one color! So awesome! I was in London when I was 7, it was beautiful and the people were so rad :) I loved it! thanks for the walk down memory lane! I love your outfit of course too! what is the most appealing about this post is you have photo after photo in stark black/white which is quite fitting with the rainy atmosphere of the city on the verge of a gray winter, then suddenly, wham! one lone photo in color- a nice surprise. another lovely ensemble here; the boots have a wonderful versatility. from my memory of big cities, i have to say miami's skyline at night is picturesque, when you're leaving south beach heading inland; it's like a fairy tale, the buildings are lit in pastel colors. and nothing beats sydney's opera house, from every angle possible. I have always wanted to visit London! I hope to in the next few years! The photo of you on the escalators when you are looking back is gorgeous! Oh God, I can not imagine how much I liked your photos. Really and what you say the title is unimportant. Give love to your dad because he is an excellent photographer, if I had a magazine would definitely working for me. Additionally, the outfit you chose for the session is super cool! I hope some day to know London, it is one of my dreams to go to that beautiful city. This outfit is, as always, gorgeous. I haven't been to London since I was maybe twelve, but I remember really loving Piccadilly Circus. 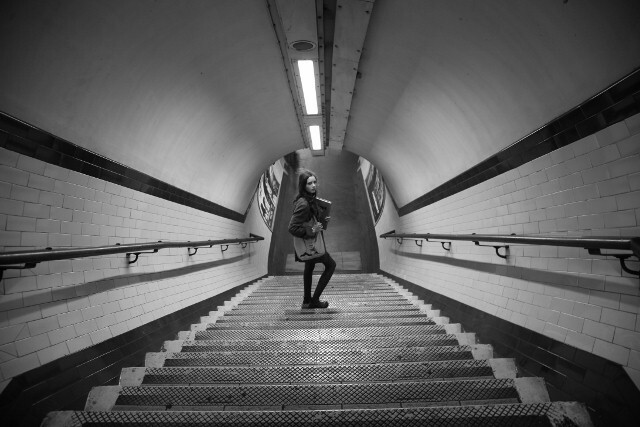 All this photos are taken all so beautifully:) So cool you got to visit London and these street photos I love them! Gorgeous vintage dress with that crochet caridgan over and those shoes I adore them. Ohhhh,are you going for an audition or something? wow..love you pics!! (: you a such a great taste !!! i love this! i think u totally capture the spirit of london, sort of busy and lonely- b&w is good here! kind of makes me want to go home! looking gorgeous as always, and i lvoe your dad's photography. he's good at black and white! ps. loving that blue mini, how cool is it taht its handmade int he 60's! You looks stunning! These are such great shots of you. I really like the second, third, and fifth. You look like a model on her way to a go-see. Wow, Roz, I didn't realise how far behind I was in your posts! Ditto for all the other comments (it's funny, some of my favourite bloggers are here, & I agree with them all. I never connected you with Twiggy til Pearl said it, because of your beautiful long hair, but if it were short & blonde.. yeah, I can see it). I'm the wrong person to comment on favourite places in London. Too many. But come the warmer weather, I hope you guys can come back to London & we'll meet in Regent's Park - do a photo shoot with your dad and other people I've met thru the blog. I found the best secret place there, it's where we shot the fashion shoot in October. especially the one next to the big statue!